It looks like the fire at South Lake Tahoe has made an impact. Severe fire restrictions have gone up nearly everywhere. Don’t plan on a campfire or even a BBQ if you are going out to visit the public lands. • NO CAMPFIRES or briquette barbeques allowed outside of developed recreation sites and specifically posted campsites or areas, and resorts, pack stations, recreation residences and other sites operated under special use permits with the Forest Service or BLM. Portable stoves using gas, jellied petroleum, or pressurized liquid fuel are exempt from this restriction (with valid campfire permit). • NO SMOKING except within an enclosed vehicle or building, a developed recreation site, or while stopped in an area at least three feet in diameter that is barren or cleared of all flammable material. • NO WELDING or operating an acetylene torch with open flames, except by permit. • NO USE OF EXPLOSIVES, except by permit. The restrictions will suspend open campfires except in designated campgrounds throughout the Forest and BLM lands. A list of designated campgrounds is available at any Inyo National Forest Ranger Station or Interagency Visitor Center. If hot, dry weather conditions continue, the restriction on campfires could be extended to include all of the wilderness areas. The Reno Gazette Journal also has stories about this. “Great Basin National Park officials began enforcing new fire rules at 8 a.m. Friday.” And the state parks are also being put under severe restrictions. State officials are increasing fire restrictions at parks because of the high potential for wildfires. This one might also impact the SNU Rally planned for the Carson River Ranches. They are also more restrictive in that smoking is inside only. Violations can result in a fine of up to $10,000 and a year in jail, as well as the costs associated with damage, suppression costs and injuries, officials said. More than 225 fires have already burned more than 12,000 acres in Nevada this year. On the Inyo National Forest website, you might also want to take a look at Fire Safety Tips or the Current Conditions Page (which sometimes isn’t so ‘current’). If you plan on camping, don’t plan on a campfire or even a BBQ – maybe, just perhaps, in a developed campground with well designed fire pits. Just don’t plan on it. The woods are dry and the conditions are ripe for a fire that will turn a spark into a raging inferno in no time flat. The July 2007 Newsletter has been posted! Note: Fire restrictions in effect! No campfires at the Obsidian Dome rally. 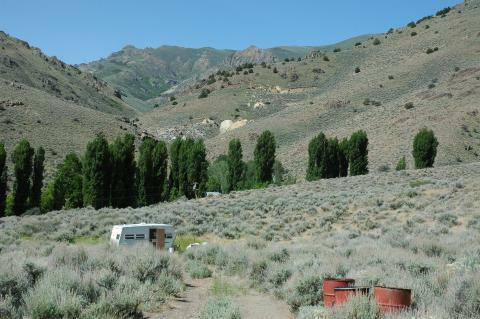 Thursday July 19 to Sunday July 22 2007, the SNU will hold a rally at Obsidian Dome (Inyo Nat’l Forest) dispersed camping – off US 395 South between June Lakes and Mammoth Lakes, CA. Follow Rick’s excellent directions and Look for the SNU signs after you turn off Hwy 395. It will be a 3 day Rally, members & guests are welcome. On Friday morning we will be working with Rick LaBorde to do a little clean up and routine maintenance around the Obsidian Dome area. Rick will have most of the materials we need for this project but do bring a pair of work gloves and possibly a shovel. There will be a Board meeting Saturday, open to all. Obsidian has great hiking possibilities, a nearby stream, and lots of geologic areas. We will have our usual Happy Hour and shared meals. Arrival time – anytime after noon on Thursday July 19. Note: Don’t bring any eggs. Diane will have enough fresh eggs for everyone. It is amazing at how difficult it is to find a good repair shop for the RV. All of the RV related systems such as plumbing, propane, electrical, and even a trailer’s running gear, are well within the scope of the handyman yet it seems that RV repair shops can’t get it done well enough to keep folks happy. Richard says a major chain won’t install his replacement water heater because they can’t solder copper as used in his old Argosy motorhome. All it would take is a bit of modern PEX tubing and a couple of Quest or similar fittings to connect to the existing copper. Or you can use all copper without soldering using that Just for Copper stuff mentioned previously. Then there is Roman’s experience with drain valves on an older Airstream at a dealer. It seems the RV shop could not figure out where the pressure feed was or how the drain system worked. Or Gary’s experience with a loose wall that was fixed with nails sticking out of the woodwork – until he fixed the fix. Or Yvonne’s wheels deciding to leave the trailer after a bearing repack or new tires. 3 lost wheels in 25 years? One of the sources of income for some full timers is that of part time RV repair service. Nearly any town may have a mobile RV technician who will come to you. It doesn’t take that big of a tool set. Even the usual parts inventory for 80% of repairs can be stuffed in a van or are available in a nearby hardware store. The internet makes even esoteric or unusual or hard to find parts only a few days away. What may curl some folks’ eyeballs is all the extras and gadgets that are in many modern RV’s. That’s a different deal. The fact is that the RV specific systems you need to get your RV safe on the road and to provide the living necessities aren’t all that complicated. Get those functioning properly first then you can go camping to read the manuals and figure out why all the electronic subsystems, remote controls, and automatic whatevers aren’t doing their thing. Ever need to add a catalytic heater or do something to a propane appliance in your RV? The gas line is probably soft copper tubing that goes from the appliance to a shutoff valve underneath the rig and then to the regulator and propane tanks. Having a shutoff for each appliance and having most of the fittings outside the rig are safety measures. Gas lines use flared fittings. This is so the fitting will not fall apart in a fire. A fire could melt a solder connection causing a leak and adding fuel to the fire – at least this is what the Just for Copper FAQ says. Just for Copper is a glue for copper or brass that can be used instead of solder and might be handy if you still have copper water lines in your RV. Plumbing – the glassblowers have a nice illustrated step by step and a table of sizes for propane piping. Applications: Tube, Pipe & Fittings : Copper Tube Handbook: VIII … – this copper.org article on flare fitting is a good start to find out just about everything you might want to know about copper. Skoolie.net • View topic – How to run Propane Lines? – this is a thread on a BBS system for those interested in school bus conversions. Ryan has a good post on the copper vs iron pipe for gas debate. The Tutorials and How-to’s section has an interesting list of topics that need some readin’ time. Over on the Escapees forum is a post that summarizes a lot of experience on the budgets of full timers. One of the features of the report is that it lists the sources so you can go see where the numbers came from. The report lists annual campground expense as ranging under $400 to over $5,400. Food expenses ranged from $1400 to almost $11,000. Fuel ran between $1700 and $6800. To these basics you’d also need to add personal items, health expense, RV maintenance and other things. If you are planning some extensive time in your RV, you should check out the links to see how others do it, what they spend their money on, and what they think they need to be comfortable living in an RV. From that, you can better plan your own adventure. The WBCCI SNU Unit spent flag day weekend in Unionville. Here’s the photographic tour of the weekend in a Nevada Canyon and ghost town. See the photo gallery of the SNU Unionville Rally! Ever watch your trailer run away from you? It doesn’t take much of a slope because trailers are designed to follow whatever pulls on them. That is why it is important to make sure you have good wheel chocks for your trailer. You need chocks on both sides of the trailer and for at least one wheel on each side. You need chocks on both sides of the tire unless there is a definite slope in which case a chock on the downslope side of the tire is usually enough. The chocks need to be as wide or wider than the tire and tall enough so the tire won’t roll over them (a quarter of the tire diameter should do). They need to have a firm grip on the ground so they won’t slide. Note that the BAL between wheel chocks (as in the picture below) depend upon friction and have only a small height against the tire. This means they can be rolled over but are a convenient size. Other between wheel chocks can be much larger but are less likely to be dragged between the tires. Never unhitch until the trailer is properly chocked. When unhitching, remove the safety chains next to last and breakaway switch lanyard last. Pay attention to movement when you uncouple the ball. No matter how well you have things secured, you may get an inch or so of movement off the ball but no more. Here’s one with BAL between the wheels chocks plus ground chocking for all directions. When the tires are blocked up, it can be difficult to get good solid chocking but that is when it is needed most. The SNU was expecting a nice quiet camping weekend out away from it all. The sheep were OK and interesting. The Summer Geology Field Camp was something else. At the University of Nevada, Reno, the geology majors put in an extensive hands-on geology experience in the field for six weeks. The students get up close and personal with Great Basin geology and the life of a field geologist. So it was a bit of a surprise to see Prof. Rich Schweickert and his assistants and forty or so students arrive en masse late Friday evening to set up a Unionville base camp. They had left one Suburban out somewhere with a blown motor but were able to shift loads and get everyone to camp safe and sound. Some of the students from eastern universities were getting their first experience of what Nevada was all about. A lot of the students were obviously more into geology than camping. Not often a rally is overrun by a hoard of twenty something college kids — Made for an interesting experience. On I80 westbound just east of Reno near Wadsworth is a beat up rest area. NDOT keeps it clean but it gets heavy use. There is a dump station for RV’s and it will nearly always have people waiting for their turn at the end of a holiday or weekend outing. Now there is WiFi available, too. See the NDOT PSA. You can see the satellite dish and the Wifi antenna on the roof (click on pic for larger view). The PSA says it is a DSL connection so the dish serves other purposes than Internet access. Access is guided and filtered and free for only the first half hour. Seems it surprised some others, too. See the unplannedtravel blog. Still don’t know what an Ione is? Here are some links to help you find out. The idea was to use the RV park there as a home base for an SNU Rally but it appears that that business has closed down. So Don is talking with the folks over at the state park to see if we can squeeze in there somewhere. Ione Nevada! This site is dedicated to exploring western ghost towns, mining camps, mines, railroads, railroad stations, stage stations and any other historical sites, including old cemeteries. Ione, Nevada – more pictures. reviewjournal.com — Business – IONE'S POWER PLAY Daily news section of the Las Vegas Review-Journal. Nevada's largest newspaper. Wild Nevada – the KNPB television show. Plausible De-nye-ability: Just How Big Is Nye County? The sheep are visible in the canyons. On the way to the Unionville SNU Rally site there was a flock of sheep at the entrance to the canyon. Later in the day, an old, beat up RV went up the canyon past the Airstreams. That was the sheepherder moving camp. A bit later the flock could be seen on its way up the canyon to Congress canyon where the creek provided good water for the sheep. There were dogs that were guiding the sheep but you didn’t want to get close enough to the flock to see them. They don’t seem to count sheep, either. The story was that there was a black sheep for about every ten white ones. So the herders would only count the black ones. They figured that if a group wandered off, it would probably include a black one. So counting the easy to spot black sheep provided an easy way to quickly determine if the whole flock was together. In this picture you can see the sheep almost looking like popcorn in the sagebrush on the canyon sides along the creek. Battery discussions are where you can tell the difference between the RV Resort campers and those who spend their time out in the boonies off grid. For those who like to get away from it all, there is never enough battery capacity. How far down to discharge your batteries is a balance. Discharging them to a higher state of charge will make them last longer, but you will have to charge more often or have more batteries, involving initial expense, space and weight. Discharging them to a lower SOC involves less weight, less space, and has lower initial expense, but sooner replacement. There are very many sources of good information out there. Unfortunately, the discussion forums often include bad advice and no way to tell what is good advice from bad. So, check these out and compare the information they provide to what else you read or hear. Learn for yourself the factors involved and how important they really may be to your particular needs. Comparing Marine Battery Technologies is an introductory page with some basic information and a lot of links to more depth. His page on battery types has some good comparative information on cost versus capacity and lifespan. Electric Vehicle Battery Information “Battery university – Get the Coffee! It’s an all-nighter.” – a list of links. Car and Deep Cycle Battery FAQ – “Battery Manufacturers and Brand Names List, and Battery consumer information and answers to frequently asked questions (FAQ) about car and deep cycle batteries.” This from a domain named batteryfaq.org! Battery FAQ This is from one of the better alternative energy equipment suppliers in Arizona. http://www.happy-wanderers.com/6volt%20vs%2012volt.txt – this is a poorly formatted web page that has some ideas but clues you in to needing a great deal of skepticism by its claim “true deep cycle battery” for the generic golf cart battery. When you see pronouncements about “true deep cycle” or unqualified judgments about something being best your skeptics hat needs good attention. The only simple thing about RV energy storage batteries is that how they serve you depends upon how you serve them. Get batteries designed for the job. Don’t discharge them too deep. Recharge them properly and promptly. How does your dog respond to thunderstorms? USA Today has a story about Tommy, a retired greyhound, that looses it when the thunder rolls. (See Not ‘storm-proofing’ your dog can be dismal By Sharon L. Peters). Tommy’s reaction soon escalated from panting and pacing to whining and trembling so severe he’d lose his footing. “It was pitiful,” Jane Lloyd says. Tommy was desperately clingy, and they feared what he’d do if thunder hit in their absence. For now they give Tommy some medications before the storm rolls in and place him in a small, windowless, powder room. The USA Today mentions some of the other techniques and methods tried to help calm the dogs but cautions about the need to be very careful. The ‘alternative’ herbals or botanicals can be toxic in improper doses just like medications intended for humans. Behavior modification seems to be the best long term solution. That is not something you do to the dog but rather something you do with the dog. Perhaps the best example of this can be seen in Cesar Millan’s show on the National Geographic channel. A good rollicking thunderstorm can be quite an experience in an RV. Adding psychotic dog to the mix might not enhance the experience. Take care. Unionville is squeezed in a canyon as you can see in this maps.live.com screenshot. On the right to the east is the valley the heads north to Winnemucca. On the left to the west is the ridge that has a dirt trail over to Lovelock. The county park is on the north side of the road near the left of this picture. 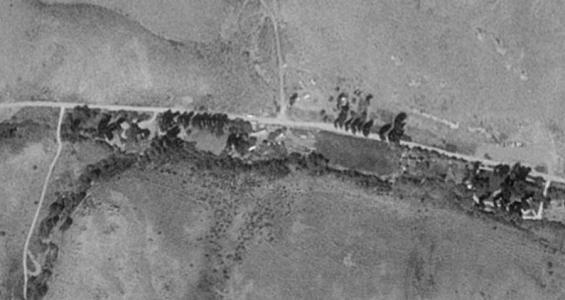 This is a closer view with the park near the center of the photograph. You can see the gravel road that heads to the north and serves as the entrance to the parking area. The parking area shows as a loop with the picnic area trees to the right. Just past the park up the canyon the creek takes a bend to the south. There is a nice house on the outside of this bend. If you get past this point in the canyon with an RV you are likely to have an interesting time turning around. The check the weather forecast, see the weather underground. Dale’s memorabilia of the early days of the WBCCI provides a glimpse into the very early days of recreational group travel. What an adventure for an 8th grader! 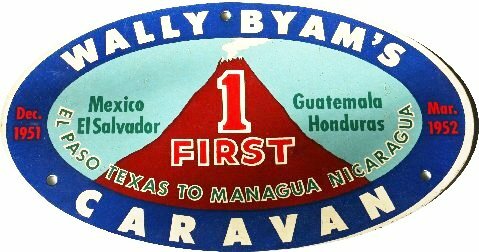 Dale (Pee Wee) Schwamborn even had class assignments to explain his absence from class while on a central American caravan. For the next 15 years he has a direct experience to share. Prior to this, perhaps the next previous such caravans were the wagon trains moving west in the latter part of the 19th century. 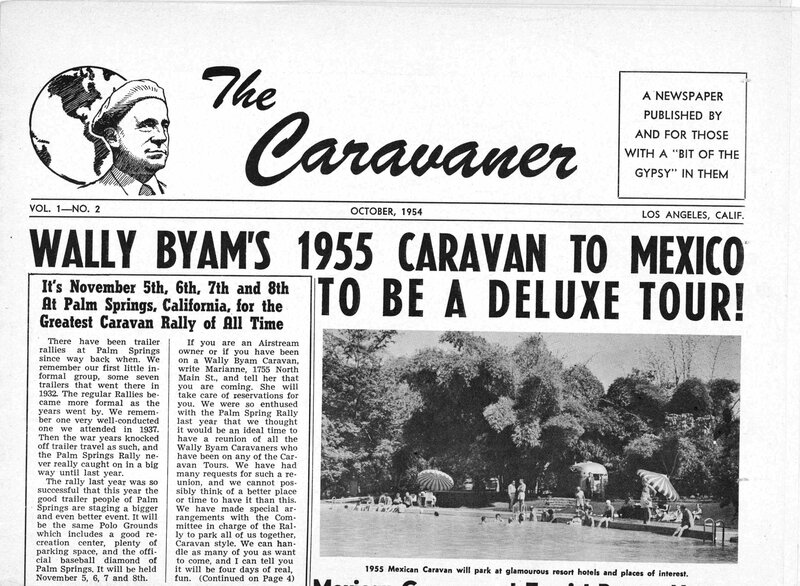 The caravans of the post WW II era were a unique confluence of technology, international politics, and personal capability that created memories that tell us a side of life not usually found in the history books of the era. Check out PeeWee’s recollections of the early WBCCI Caravans! The Reno Gazette Journal reports that a CD will highlight U.S. 395’s history. This is the result of a $2,500,000 grant to create interpretive audio that will “make people aware of the region’s natural, scientific and cultural history as well as festivals and points of interest in the communities along the way.” A 13 part audio program is being planned. Middle school students will learn how to use recording equipment to interview scientists for the project. Distribution will be via the internet and also on CD at various commercial interests on the highway. The National Science Foundation funding is going to UNR’s Academy for the Environment and the College of Education’s Raggio Research Center. Partners in the effort include the Eastern Sierra Institute for Collaborative Education and the University of California-Berkeley’s Lawrence Hall of Science. On the editorial side of things, I wonder. This sounds like a 2.5 million dollar federal grant for a gimmicky middle school education program rationalized as a rather standard region promotional effort. Being a School of Education project implies that the ‘science’ is going to be highly flavored with the political taint du jour (See Wellington Grey — A physics teacher begs for his subject back: An open letter to the AQA board and the UK Department for Education). Similar projects, in the form of magazines, are available at no cost to the taxpayer. This project seems to be tugging at the technology dreams that have been so common in education over the last thirty years. The mention of learning about “digital recording” for middle school students is one of several examples in the report. Recent studies indicate that a lot of the ‘computers in the classroom’ projects have not met the dreams often used to rationalize the expense. The art and science of recording an interview is made somewhat easier with newer technology but the basic craft is still the same whether digital or analog. The education establishment is finding that the same idea holds true in many areas. Information technologies (e.g. computers) sometimes make things easier but they are not a substitute for the person who knows what he is trying to do. Then there is the ‘competition.’ Kids in the car nowadays often have DVD players to watch their favorite movie or a video game console to keep them busy. How is an audio only CD going to compete with this when the scene outside the window cannot? US 395 is a living laboratory. The eastern slopes of the Sierras provide many opportunities to learn about geology and biology and their supporting sciences. A lecture on CD is one thing. Having guided stops to examine rocks and plants in the micro as well as the macro would be real science. You need to be able to see and touch and smell as well as hear some dude in an interview. You need someone to point out to you what identifies a rock or a bio-zone or a geologic feature and how it fits into the rest of its environment. There are now a few guidebooks that will take you step by step along some route. I have one for the geology along US 50 written by a UNR professor. This ancient media, the book, allows me to match its contents to my current location. It provides illustrations and pictures to point out to me what I need to see. It could easily be edited for a middle school level experience and enhanced with field and laboratory exercises. The book is an ‘appropriate’ technology for this sort of effort. Multi media, even limited to audio only, does not match the requirements for interruptions, reference, or detail. A book wouldn’t take 2.5 million tax dollars, either. For another example, see The I-580 freeway extension construction website. This is a Nevada DOT site about the freeway between Reno and Carson City. If you want to learn about a difficult highway engineering project, that is one web site to visit. You can even view web-cams of work in progress. The site is an example of how the web (modern information technology) can be used in an incremental way to support learning. It is a contrast to the monolithic approach taken in Roadside Heritage Project and may have a lesson waiting to be learned about the best way to direct efforts to educate the public about US 395. Pee Wee remembers the Jack Rabbits. These were a group of “feisty” WBCCI club members who made sure to take care of things. They were often out ahead of the rest of the group and made sure that accommodations were set up for everyone following. There is a group somewhat like this now except that its civility suffers and it is not geared towards caravans and rallies but rather club politics. The WBCCI could certainly use an advocates group right now that was constructive like the Jack Rabbits: Folks who set the standard for setting up camp and taking care of others rather than just taking care of themselves and their own fantasies. Read Pee Wee’s recollections on the Jack Rabbits. 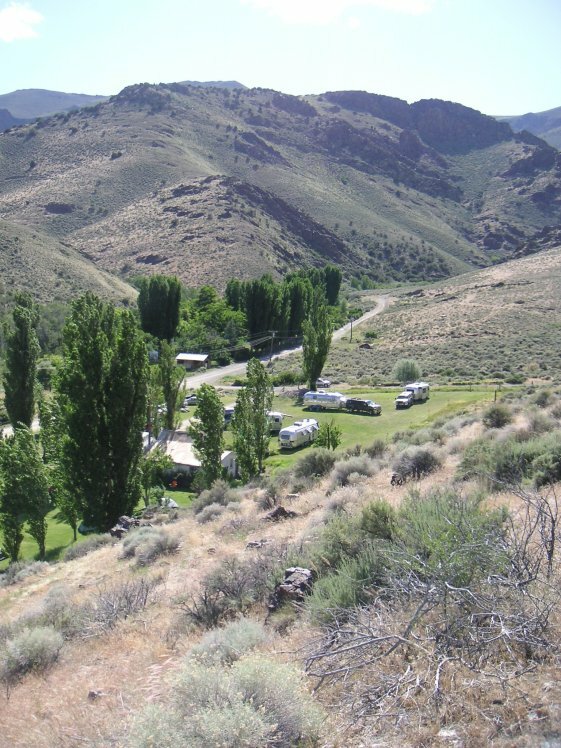 The June 2007 Sierra Nevada Unit, WBCCI (The Airstream RV owners club) Newsletter has been posted. ** Note: There will be no brunch at Old Pioneer Garden this year. -> Have you visited the SNU private site on Airforums lately? See Sierra Nevada unit, WBCCI #157 – Private Club Forum. SNU member Mike Orchard is the moderator of this private SNU discussion group. See a photo gallery of some of the front pages from the early days at PeeWee’s corner on the website. About three or four hours out of Reno on I80 east gets past the 40 mile desert and the Humbolt sink. Winnemucca is a good stopping point if you need full facilities. For the boondockers, the Mill City and Imlay exits are tempting. Unionville has a county park a few miles south of Mill city. It is a wide spot in the canyon that makes it tough to find level parking but a pretty drive and a restful spot for a night or two. North of Imlay is the upper end of Rye Patch reservoir. It is said that there are some spots there where you can park overnight. Rye Patch Reservoir State Recreation Area is below the dam a few miles farther west along the freeway and that would be a more sure spot for an overnight although subject to fees. 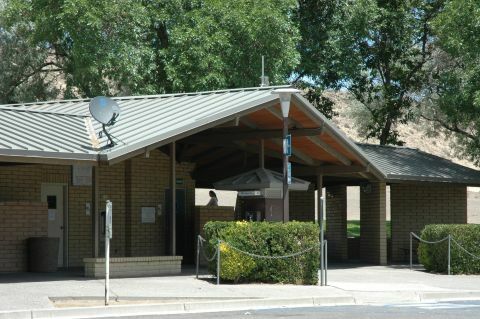 The state park is open all year, has showers and a dump station, and paved parking spots. Historic Marker 145 Located at the junction of State Route 400 and the gravel road to Unionville in the Buena Vista Valley, fifteen miles south of intersection with Interstate Highway 80. Historic Marker 232 Located in the County Park in upper Unionville, Nevada for the genealogists. Wild Nevada (PBS TV Show) tells about the Winnemucca to Unionville and other nearby ghost towns. The Literary Traveler has a good rundown on Mark Twain at Unionville. The Sierra Nevada Unit of the WBCCI will do a weekend rally June 14 to 17, 2007 in Unionville. See also the destinations page for I80, Reno to Wendover for more about places on this route through Nevada.